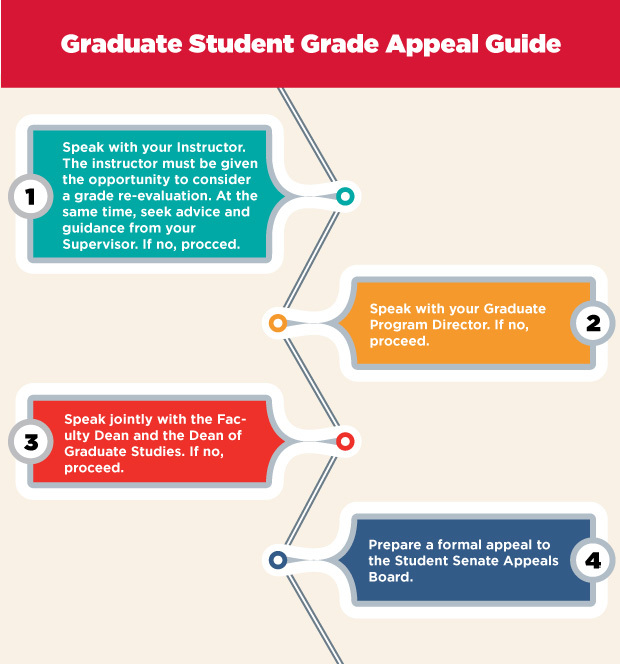 Graduate Grade Appeals are outlined in section 14.10.1 of the Faculty Handbook. The Graduate Calendar also outlines grade appeals. Familiarize yourself with polices around Student Evaluation and Performance and Graduate Evaluation in section 14.9 of Faculty Handbook. Evaluations Duties of the Instructor are found in section 10 of the Faculty Handbook and Grading Standards in section 10.2. 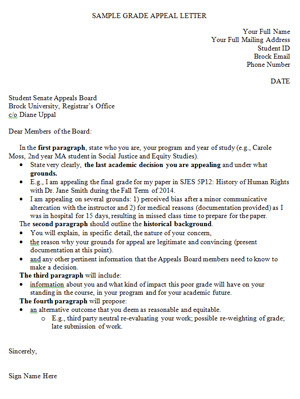 Preparing for the Student Senate Appeals Board is in section 14.10.2 of the Faculty Handbook. SSAB appeals procedures are also found in the Graduate Calendar. You have 30 days from course closure, to file a grade appeal. Ask for all outcomes to be offered in writing (e.g., ask your instructor to write down the reasons your grade re-evaluation was denied). You have 30 days to file an Appeal with the Student Senate Appeals Board after the Dean has made a final decision. Late Appeals are only considered with exceptional circumstances. Procedural error (e.g., instructor failed to follow rubric, syllabus; misinformation or poor guidance was given; TA/instructor lost paper). Unfair Assessment due to perceived bias or discrimination (e.g., you had an altercation with your instructor and now fear reprisal). Quality Assurance based concerns (e.g., TA or Instructor demonstrating inability to assess work fully or accurately). Medical Reasons (e.g., you failed to communicate to your instructor that you were ill and missed class, resulting in a poor mark on major paper). Life Event Issues (e.g., there was a death in your family). Student Specific Issues (e.g., you failed to mention a disability or ailment that hindered your success in the course). Travel plans conflicting with a piece of coursework. Medical or personal events that happen outside your immediate family (e.g., death of a grandparent). Personal sickness that is not profound or prolonged (e.g., a doctor’s note covering a day or two worth of course time). This stage is informal. Best practise means setting up an in-person appointment with your Instructor and Supervisor to discuss your grade and how it was evaluated. Email and phone aren’t as effective when trying to advocate for increased grades. Speak with your Supervisor about your concerns with a course grade. They can offer you advice and guidance through the process; tips for speaking with the Instructor; and troubleshoot ways of moving past the issue. Supervisors act to advise, monitor and mentor – utilize this resource and source of information, coaching and support. Familiarize yourself with Academic Freedom section in the Collective Agreement between Brock and the Brock University Faculty Association on page 18 as well as the Faculty Teaching Rights and Responsibility section 12.04 on page 20. (e.g., outline areas that you feel were graded harshly; point out areas in the rubric that may not have been abided by; present documentation that may explain poor grades). Always communicate with your instructor about any issues you are having that can impede your success in the course. This increases the likelihood that your Instructor can and will help you. Inform the Instructor that you are bringing your concerns to the Graduate Program Director. Familiarize yourself with the roles and responsibilities of the GPD in section 16A.04 of the BUFA Collective Agreement on page 35. Book an appointment in person with your GPD. Send your GPD a copy of your grade rebuttal and any communication between yourself and the Instructor that will be helpful. Present your case verbally to the GPD in a meeting. The Deans are the final decision makers for your appeal. Familiarize yourself with the Duties of a Faculty Dean. Prepare a document for the Deans outlining all of your concerns about your grade, and about the process. g., A third party to evaluate your work rather than the instructor. g., If the work cannot be resubmitted or rewritten, offer an alternative. If you are not satisfied with the Deans’ final decision, you are welcome to appeal within 30 days of the date stamped letter that he/she sends you via mail.